It's easy to lose sight of our aspirations and dreams while living in a world where so many horrible things seem to be taking place at a rapid pace, but luckily Fucked Up are here to remind us there's still some good in the world. 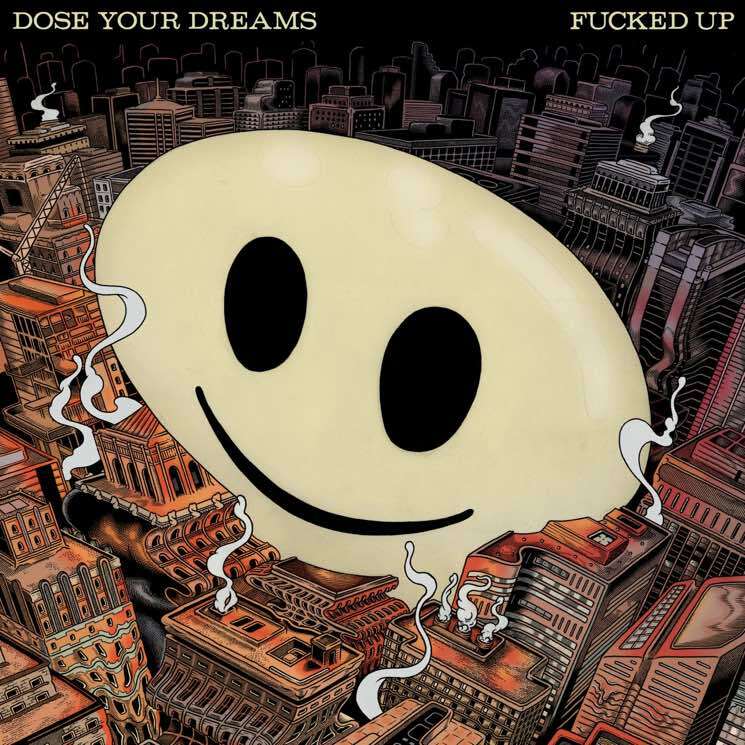 On the band's fifth full-length album, Dose Your Dreams, they take some time to remind us to strive for more and overcome the hardships of the world we live in along with a whole host of guest musicians. While the record makes listeners ponder ideas such as greed, capitalism, emotions, relationships and more, it does so through the lens of the David character, who has been a running thread throughout the band's existence. While David Comes To Life's beautifully complex sound was boosted through its story, Dose Your Dreams somehow achieves this in an even greater way. If it took a few listens for the story behind David Comes To Life to fully make sense, the new record will let you relive that experience all over again. Without giving away the entire story, since it's definitely worth poring over in its entirety, David begins his journey deeply unsatisfied with the frustrating truth that the world is driven by mindless labour after being sent on a vision quest by Joyce Tops, a 1920's revolutionist vagrant anarchist. After a lengthy series of events, David becomes free of his ego and understands that to be truly happy, he must give action to what he desires, but he can't simply know the truth. He needs to share it with others. The album's many plot points are brought to life through fantastic musicianship and experimentation with Fucked Up's sound. Given the band are always refining their sound, it's interesting to see them do so with some really unexpected twists and turns, such as the disco-leaning "Dose Your Dreams" or electronic-heavy "Mechanical Bull." They also draw on a lot of old-school rock vibes across the record, particularly standing out on songs such as "Normal People," "Living In A Simulation" or the Jennifer Castle-led track "Came Down Wrong." While it's strange on paper that vocalist Damian Abraham doesn't appear on a good chunk of the record, there's so much going on in the album's nearly hour-and-a-half runtime that you hardly get to notice. Songs such as "Two I's Closed" or "Love Is An Island In the Sea" will leave you questioning if you're still listening to Fucked Up for a moment, due to their softer approach, but each different sound on the album serves a purpose and balances things out. Where Glass Boys felt like a stripped-down snapshot of who Fucked Up are, Dose Your Dreams is a communal affair that will challenge ideas of what they are.